Creative Mode - No restrictions. Sandbox. Obviously. Survival Mode- Just like Survival mode but mobile. Multiplayer- I don't know if large maps would be hell on the iPod, but mine seems to load a map as large as the LA map for Gangstar: West Coast Hustle, and it's pretty big, so I don't really know. But it's just like Multiplayer, but again, mobile. Works by WiFi. Player Levels- Two slots on account of memory space. Log In: Obviously, it would go to another screen with where you would type in your Username and Password so you could save maps on Survival or Creative, and play on Multiplayer servers. Version, Fps, & Chunk Updates- Self explanatory. VAnalog- The virtual analog stick for movement. Crosshair- Just like in the game, except you tap it to place or delete blocks. Chat- Two lines of chat come up, can be extended by possibly a small button beside it. Block Selection- Three to four blocks, double tap a block to bring up the whole selection of blocks, like B with the default Minecraft settings on the computer would do. B/D- Could possibly have these shortcuts written on them (as they are.) Stands for Build/Delete. It would be on Build at startup, and have a B on it. Once you tapped it, it would change to Delete, and a D would be on the button instead of a B.
A- Arrows. Shoots arrows when tapped. M- Menu. Tap it to bring up the Menu with Options, et cetera. Along with a "Player List" for Multiplayer. Anywhere on the screen- Two uses. --One: Tap, hold and swipe to look around. --Two: Regularly tap to attack with your hand in Survival Mode. Obviously, it will look more like Minecraft, this is just a layout. I'm sure it's been suggested before, but this has been in the back of my mind for ages now. I also remember reading somewhere that Notch was thinking of making Minecraft for Android or whatever. *This is obviously not to real life scale. Virtual Analog- Move around. Like that of a console such as the XBOX360 or Playstation3, but virtual and touch based. Build/Delete- Press it and it will toggle to Build, and maybe have the world "Build" appear underneath it. Press it again to toggle to Delete, and again, possibly have the word "Build" be changed to "Delete"
Jump- Tap it to jump. Menu- Brings up the menu of Options, etc. Chat- Double tap to bring up the devices' keyboard, type in your message, and hit enter to send it. Double tap it to bring up the iPhone/iPod Touch keyboard and type in your message. Hit enter to send your message. Menu- Brings up the menu of Options, etc. With the added "Player List". Arrow Button- Like Tab. Shoots arrows. Here's an example of the controls in the Call of Duty: World at War: Zombies app from Gameloft. Many of my ideas for this are based off of their control scheme. The way he moves it around is wrong and a waste of time. It's much easier to just hold and move the screen around in that app. I'd know, I have it. *Note: You'd tap the cursor, not the screen anywhere to delete or place blocks. **Second Note: You'd hold your finger anywhere on the screen except the cursor and move it from left to right, still holding, to look around. I realize the screen is quite cluttered on my example, but that's because of the writing I had put in to help explain my idea. If there were any layout issues, I'm sure they could be figured out if Notch were to make this game any kind of application for any touched based device. There you go. I'd pay for it. I've always found that FPS games on a touch screen device that lacks actual buttons typically don't work too well. Something like the DS, on the other hand, I would spring for in an instant. This would finally give me a reason to buy an R4 card, if it were released as homebrew software instead of retail. Buying an application that's actually free in the official website. You're getting scammed, you're just gonna pay twice as much as the Premium. Because we're going to sit at our computers and play Minecraft on our iPods. The point is for it to be portable, dumbass. And if Notch made it, who said he'd make you pay? We're just saying we would and support the development of Minecraft. Minecraft, portable? The thought is highly intriguing. I'd play it all over the place. I am thinking about it even more. Oh man, that sounds so awesome. The Android would be nice... DS as well... but then Notch would be stepping into the corporate arena. I am not for or against corps, but that would really depend on how he felt about that. Additionally, he would have to complete Minecraft before taking bigger steps. I figure, something like that could possibly work. That is, if someone were able to somehow get Minecraft to run on a DS to begin with. Future project for Notch, perhaps? Get it made into a commercial game? Just think, Minecraft multiplayer on DS. Location: I don't know, i lost track. 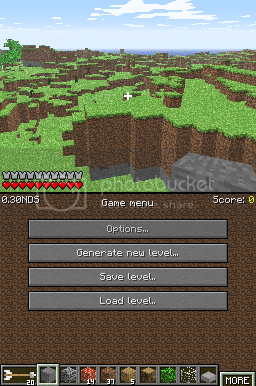 This is if the bottom screen is freelook, the top screen shows info like health, Fps, Arows, name of map/server. See? enough buttons for all the controls. Makoto: I'm a PC, and ragequit was MY idea. Using the touchscreen to look around AND the face buttons for actions would be rather difficult to control. It'd be impossible to make any quick actions, like running and jumping, and forget fighting off the undead hordes. If touchscreen look were used, control should be like a standard DS FPS: Use only the buttons on your non-dominant hand side. D-pad and L for right handed people, A/B/X/Y and R for left handed. Any actions not covered by those can, for the most part, be handled on the touchscreen, and maybe start and select for minor tasks. The Atari ST has a mouse and keyboard, I expect a port then seeing as no one cares about memory or graphical limits. I wasn't really thinking about survival when i made these. I mostly play minecraft in creativer. It's not homosexual. Due to the retardation of the newer generations, "gay" has just become your typical insult such as "****er" or "shithead". There's no point in arguing with it. If homosexual people really do get offended, I tell them to **** off and that people don't actually mean it as an insult towards gays and that it's just your random offensive term. Fair enough. I'm willing to concede that different people have different tastes in controls. Preferably, the game would let you customize them to the maximum extent allowed, so that control setups like any that've been listed in the thread so far could be made. Alas, the chances of this being made in general are pretty much slim to none, unless a developer wants to pick it up once Notch finishes the PC version. I suppose the words "lags like hell" doesn't run through any one's minds does it? You have a specific platform, so you can optimize it for that platform, none of the bells and whistles of supporting each computer systems native functions. So it actually doesn't cause too much trouble. At this time, I don't think Notch should have any concern about porting Minecraft to other platforms. He needs to progress further with Minecraft first. Pigs and sheep still drop mushrooms instead of meat, for Pete's sake! Well we can just prepare for the future if he plans to port it, right?